The purpose of Major Chords for Minors is to provide opportunity for youth to explore and cultivate their musical talent through private music instruction and to build a better community through our children. Major Chords for Minors was established on July 14, 2011 with receipt of the IRS Determination Letter, proclaiming Major Chords for Minors a federally recognized 501(c)(3) non-profit organization. In October of 2011, Major Chords for Minors' board members conducted orientation for eight children and their families and with two contracted instructors we began teaching. Our purpose was to provide children with free private music lessons on piano and guitar to those whose families could not afford lessons. One year later, Major Chords for Minors was giving 53 children weekly private instruction on piano, guitar, and drums, with four contracted instructors. In October of 2012 we hosted our first recital at Pit & Balcony Community Theatre and were joined by the friends and family of these students. In that first year, two all day benefits were held with corporate sponsorships stepping up to match raised funds. Eager to share our mission with the community, we spoke to any organization who would help us to spread the word for financial support and to reach out to potential students. In addition to our fundraisers, we participated in many events across the county and region, including Wonderfest and the Cinco de Mayo Celebration on Ojibway Island, and the Saginaw Bar Association Christmas Party, to name a few. April of 2013 found us at the Dow Event Center accepting the All Area Arts Award for Michigan’s Great Lakes Bay Region. We continued our community outreach with students performing at the Free Music Festival in Freeland, Summer Breeze Music Festival in Buena Vista, “Run For Your Life,” Pulse 3 Foundation, Saginaw Community Foundation Volunteer Appreciation Night, Mid-Michigan Children Museum’s “Day with Dad,” among others. Many of these events have now become something we participate in annually. 2014 was a busy year, with 96 weekly students and many performances. Our students were allowed a special opportuntity to perform weekly at a local coffee house's open mic night as well as work with a new performance coach to help students learn to perform together and onstage. Later that year we prepared for a recital of 85 acts, which was held at The Dow Event Center Red Room. We were joined by the students' families, friends as well as many of our donors and volunteers. 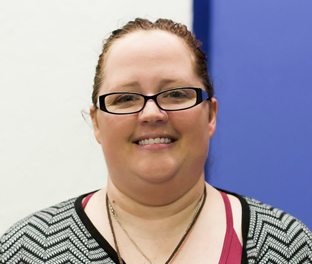 With our studio continuing to grow, we hired an administrative assistant in November of 2014 and expanded our offices. From there, we began our first choir, "Vocal Chords", in order to provide an opportunity for children on our waiting list to start getting involved with music. The choir attendance rates averaged around 12 students per week. In the Fall of 2015, Major Chords for Minors moved from it's original location - a 1200 square foot space on the corner of Court and South Mason Street - to REACH, a new community center located at 2138 N. Carolina in the City of Saginaw. We also welcomed a new project called “Major Chords for Mini Minors”, a group based music program for children ages 1-5 with adult accompaniment. With 126 students being instructed individually weekly, over 140 students on the wait list, and four instructors teaching at the same time, the move facilited the expansion of our program and created new opportunities for children to be involved in other programs located within the community center. Our new space was large enough to finally have our student lessons, choir, inventory, library, administrative offices, and Major Chords for Mini Minors all in the same location. In December of 2015, Pam Fessler of NPR joined us at our studio for a feature story about Major Chords For Minors. Gaining national attention was a big step forward, and we are excited to see what our future holds! We continued daily instruction for the 126 students weekly, and started forming a student band to play around town, “Lunch on the Lawn,” at the Saginaw County Administrative Building, the Mid-Michigan Children’s Museum, and others. Word spread quickly and we played as many functions through the rest of the summer, as we were asked. Our honor was when the Governor’s office called and asked us to play the Governor’s Service Awards, held this year at the Temple Theatre. Mini-Minors increased, and we added another instructor to shadow the director for six months, until she was ready to teach her own class. We also acquainted with Dr. Catherine Hennessy-Wolter, who joined our team for development and grant writing. At the end of 2016, we employed five staff members and nine instructors. In 2017, we were excited to be offered a wing of classrooms in downtown Saginaw, at First Congregational Church. We moved in the summer, and currently reside in this location. It has offered our program better planned spaced for our needs … adding a band jam/choir room, as well as a “perfect fit” Mini-Minor room. We now have three studio supervisors (Liza Walker, Tricia Boshaw, Margie Jackson), two choir instructors (Rachel Paar and Katie Fasson), one flute instructor (Dr. Jane Girdham), five private lesson instructors (Bruce Leaman, Mike Tesch, Ryan Fitzgerald, Loren Kranz, Brad Donley), two Mini-Minor instructors (Sonja Cissell, Tiffany Wika), and two band jam instructors (Amelia Blumke, Andy Hahn), one developer/grant writer (Dr. Catherine Hennessy-Wolter), and our co-founders John & Katrina Vowell, running administration. We are proud to be able to employ many local musicians and personnel, as we roll on 2018. I want children to experience things that I had the opportunity to experience, and more, in the their lives. I believe a child should have the opportunity in this crazy world we call home to find themselves, whether it is through music, sports, or any other activity they may enjoy. I was raised in Saginaw and I’ve been a part of this community for 53 years. I see hope for these children, if we can all take time to learn who they really are and help guide them through positive influence. Young children can tell if an adult’s actions and what they believe in are sincere. It is our responsibility to be true. Without the opportunity to learn music many children will enter the world as young adults with no idea who they are and what they want to do. We offer an outlet to be creative and true; a safe place to communicate and learn music. What pleases me most is to see our students learning respect, discipline and what real love and caring is all about. When children receive music education the whole fabric of the community is strengthened. The musical benefits of learning to sing or play an instrument during youth have been well documented. Musical training in youth correlates with numerous positive lifelong outcomes, including increased self-esteem, stronger math and verbal skills, and greater college preparedness. Participating in music also correlates with a decrease in unwanted behaviors, such as classroom disruption (including dropping out of school) and drug and alcohol use. For these reasons, and especially in our inner cities where drugs, crimes, violence, and abuse are rampant, why not keep it simple? I always knew my parochial school upbringing had a huge impact in the layout of my life, not realizing until later how impactful the musical aspect of my education was. In a classroom of about twenty boys and girls in grades 4-8, three young pianists (myself included) rotated each morning to begin the day with hymns and praises. We were all encouraged and expected to give our gifts as we had them and it was a part of everything we did. We gained valuable experience, leading church services musically, learning four-part harmonies under the direction of the hymn and choir directors, and sometimes we would have more contemporary music for special services. I felt alone in the school: most children were one of two large families and they always had a special bond that I could not find. I didn’t understand this as a kid, but did find my place and my emotional escape through music. When I transferred out of parochial school into public school, I found that I had a unique talent that made the adjustment easier. It was obvious that even back in 1979, the basics of music taught to me through private lessons and parochial schooling were far above what others in my peer group had experienced. Music shaped my life and became a profession in 1984, the year I graduated Swan Valley High School in Saginaw, Michigan. I began playing piano solo at private clubs and restaurants and had my first gig with a band at our local theatre company in 1986, in the musical revue, Jacques Brel Is Alive and Well and Living In Paris. The excitement of a responsive audience and playing with others to create this awesome sound of which I was a part captured me! During the run of the show I had invitations to play with others in the area and soon after the show closed I joined an area variety band and performed around the state of Michigan until 2001. My wish is that every child has the opportunity to receive lessons and experience what music may have to offer them in their own lives. Music benefits children and the communities in which they live throughout a lifetime. I believe music is the universal language through which we can all communicate. 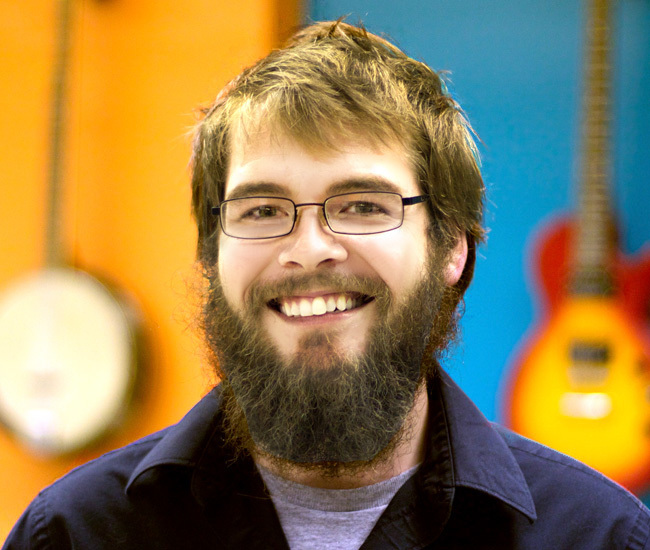 Bruce began his teaching career at Major Chords for Minors when our doors opened in 2011. It gives him great pleasure sharing his love of music with the youth in his community. Bruce’s earliest influence into the musical realm stems from his father. He specifically remembers his dad playing piano by ear, jazzing up the original versions of songs that became lullabies for Bruce and his siblings. Although Bruce took lessons as a child, he truly began to love the instrument for his own during his young adulthood. While attending and working at Delta College in Saginaw, Bruce was allowed to use the practice rooms whenever they were empty. Playing James B. Johnson, Zez Confrey, and Scott Joplin, Bruce developed the love for piano that we see in him today. Never without a cup of coffee or an interesting story to share, Bruce is a lover of music, people, and all things facetious. When asked what he loves most about the piano, a slight twinkle flickered in his eyes, brows slightly furrowed. "The hammers," Bruce said, smiling. "I just love those little guys. All covered in felt. They’re so cute." 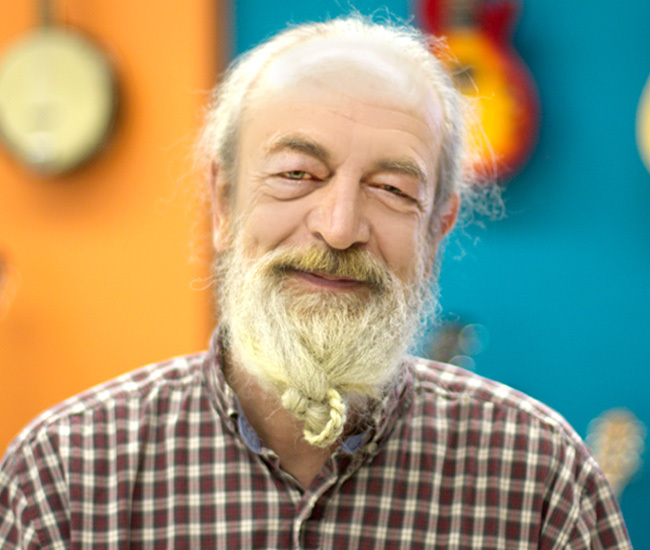 Mike has been an instructor at Major Chords since we opened our doors in 2011. Raised in a musical household, music was always within in arms reach for Mike. "I truly can’t imagine where I’d be today if it weren’t for the guitar", Mike said while readjusting the guitar strap passed down to him from his mom. Artists such as Jimi Hendrix and The Who ultimately lead Mike to pursue the guitar. As his passion for guitar grew, his influences expanded and he gradually broadened his own tastes in music. Bob Dylan, Neil Young, and Paul Simon lie amongst Mike’s largest influences. Mike currently spends his time writing and recording his own original music and released his first full length album in the summer of 2015. A perpetual deep thinker, Mike is often writing and rewriting his lyrics, jotting down lines whenever they may come to him. “Music has been a driving force in my life for as long as I can remember, and I want to share that appreciation with the younger generation,” Mike says. While attending Freeland High School, the band program gave Loren ample opportunity to play and learn more about music. During his time at Central Michigan and Wayne State University, he was able to strengthen and build upon his musical foundation. Loren's love of the drums stems from his uncle, who played professionally and often offered him pointers on the drumkit. Loren's inlfusences range from his uncle to some of his other favorite drummers, such as Steve Jordan and Levon Helm. During a four-year gig with Ann Arbor's The Ragbirds, Loren toured through 46 states! Now gigging with his own band Barbarossa Brothers he hopes to make it to all fifty. Ryan began playing the saxophone in the fourth grade, learning guitar, bass, drums, piano, and violin in the years after. Ryan spends the most time playing his upright double bass, which he has been playing for 16 years. Ryan’s interest in music began at a young age. While the bass was not the first instrument Ryan played, he would often practice playing bass parts on his brother’s guitar, slowing learning covers of songs. Eventually, Ryan, Eric, and their neighbor Spencer would get together to play, covering songs by Metallica and The Offspring. Ryan has been a part of the mid-Michigan music scene since 2005, providing him with opportunities to travel, record, perform, and teach in a multitude of settings. Ryan’s first band, Barbarossa, was formed in high school. Over the course of the next eight years, Ryan was a part of over ten different bands. 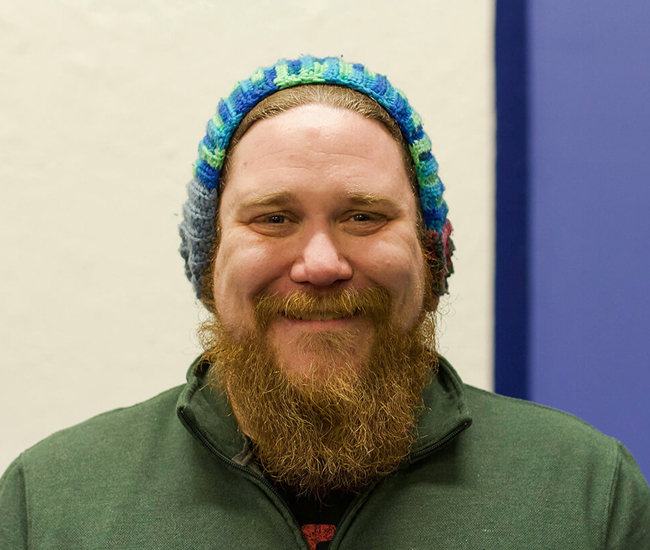 Ryan can be seen playing regularly with Bryan Rombalski and Three Worlds, Sprout, Barbarossa Brothers, and various shows throughout the season with Pit & Balcony and the Saginaw Choral Society. Brad began playing piano under the tootalage of his grandmother at age 5 but really began studying music in depth after he got my first guitar at age 12. After transferring to Mott Middle College his freshmen year of high school, he joined their steel drum band learning to play a large variety of percussion instruments and under the instruction of James Coviak gained a love for Jazz and Music theory. After High School, he completed an internship with luthier Bryan Galloup at Galloup School for Guitar Building and have been an active member GAL (Guild of American Luthiers) since 2006. Shortly after that, attended UofM to complete his degree in music under the tutelage of his once high school teacher James Coviak who headed the music department at UofM Flint at the time. As far as teaching private lessons, Brad started teaching his junior year in high school and have done so ever since. Taught at Alpha Music & Instruction 2002-2006, Grand Blanc Music 2008-2016, Major Chords for Minors 2016-present. Nick Bujouves has 17 years of experience playing bass guitar (five in the Michigan alt-rock band Dalinian) and several years of studio experience. Nick approached Major Chords in the summer of 2017 with the ambition to build them a small, but functional, recording studio. This was made possible by John Vowell bringing him aboard and also through a generous recording equipment donation made by Alex Larson. It is Nick’s intent to provide a creative space where the young musicians feel free to express themselves more permanently through a recording medium. 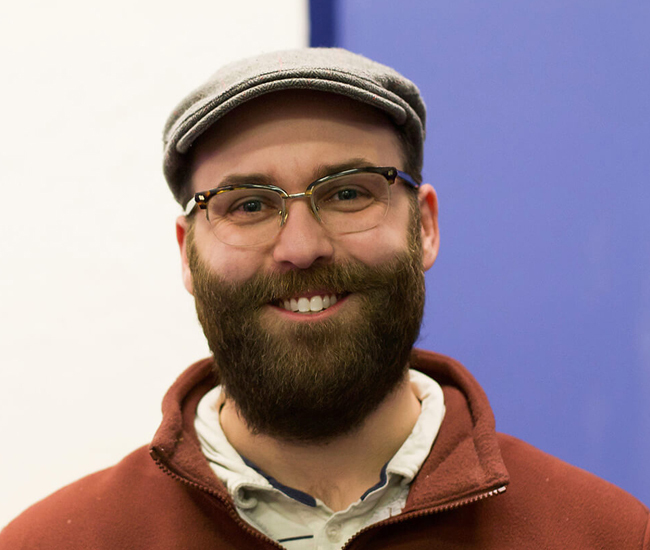 His primary focus is teaching the students how to navigate the digital recording landscape to simply and quickly capture their ideas, as well as introducing them to more in-depth recording techniques and methodology. He wants to foster the students to realize their creative potential – both independently and through collaboration with their peers. 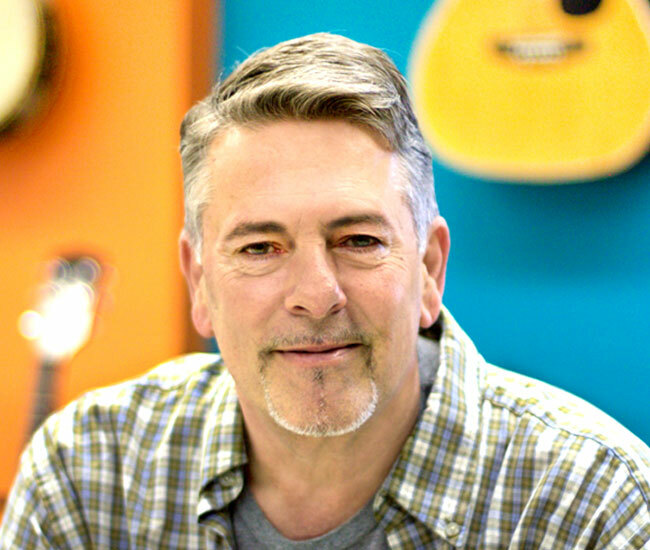 In his words, “It is my goal to develop the students to a point to where they no longer need me and can begin teaching each other.” Andy Reed of Reed Recording Company is a big recording hero of his! Liza has been a lover and avid supporter of MCFM from the very beginning. 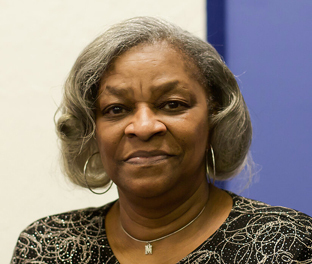 Before working as a studio supervisor, she volunteered much of her time helping with fundraisers and events. As a studio supervisor, her favorite thing is to spend time with the kids and watch them learn and grow into their personalities and musical abilities. Liza has been surrounded by music her entire life. Growing up in a family of musicians and through piano, guitar & vocal lessons she was exposed to various artists, instruments & experiences from a young age and it has carried throughout her life. In her free time you might find her at the river, enjoying nature, drawing, or catching a live band somewhere. Tricia was hired as a Studio Supervisor in September of 2016 but was no stranger to our studio. She began bringing her son to lessons at our first studio in 2013. She loved being around the kids and getting to watch them grow as musicians. 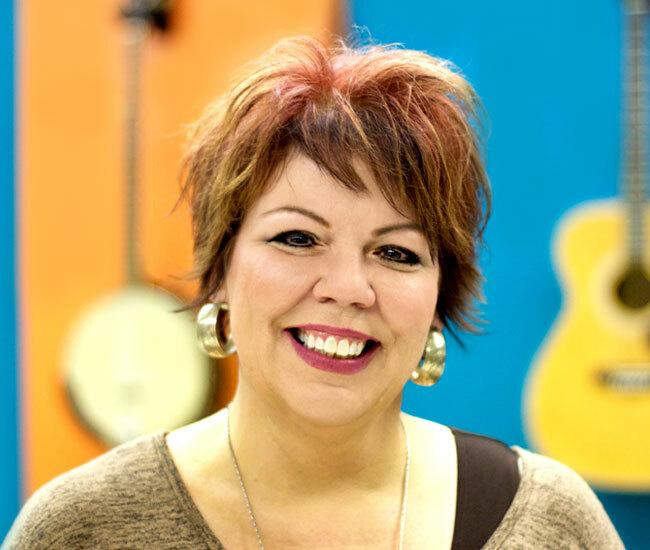 Because of her love for children and music, she knew a position at Major Chords was the perfect fit for her and her family. Her love and appreciation for music began when she was very young. At family gatherings, there was always some kind of music being played by her father or uncle on guitar. She remembers singing along at a very young age. When she isn’t at the studio, Tricia loves hanging out with her family, doing crafts, cooking, gardening, and of course listening to music! Dr. Jane Girdham started her involvement with Major Chords For Minors in the Spring of 2014. She met with the Vowells to discuss how SVSU could become involved with MCFM. Jane, who is a Professor of Music at SVSU, suggested founding a children’s choir as a way of involving a group of children on the waitlist at MCFM as well as some of her own Music Education majors. She now supervises two SVSU Music Education majors in directing the choir, Vocal Chords. In the Summer of 2015, Jane and Heather Seaton, one of the choir directors, were awarded an SVSU grant to research the available choral programs of study and identify the one that best fits the MCFM Choir. Heather and her co-director, Emerald Joiner, have now implemented this over the course of the past year. In February of 2016, Jane began teaching a small group of beginning flute players for MCFM and she hopes to start a second group soon. 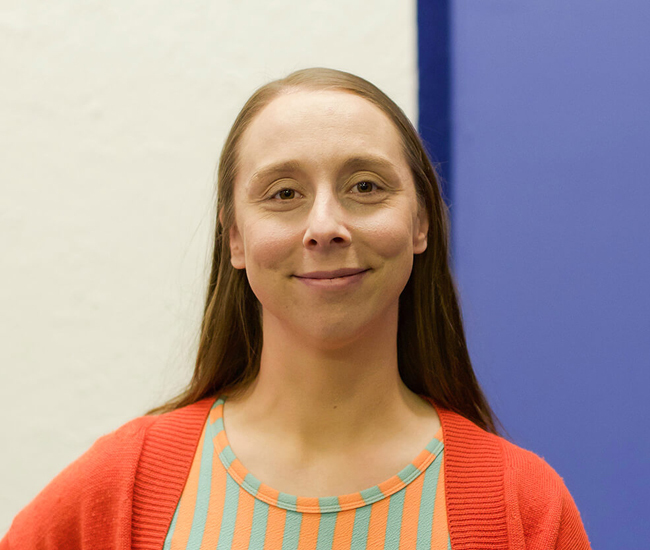 With five years of experience teaching elementary music, including directing elementary school choirs and Orff ensembles, Sonja has always recognized the importance of music education for young children. She also directs the children’s Christmas musical at her church and is a member of the worship team. Her passion for music education and the impact it can make on children’s lives has her thrilled to be able to team up with Major Chords for Minors to offer Major Chords for Mini Minors to the community. Tiffany is proud to be an instructor at Major Chords for Minors, currently teaching classes for ages 3-5. She seeks to create an environment where children can feel supported as they try new things and explore their creativity. Tiffany has been teaching mini minors classes for one year, having recently moved to Michigan from Oklahoma. She brings a variety of experience and training in classical music. Tiffany is active in music throughout the region, as both a singer and piano accompanist.